This 11 track collection, billed on stickers attached to some editions as ..."Bowie's Greatest Hits", contains album versions for five tracks though a different single version had previously been released. Two of the tracks had previously been released as "b" sides, one of these (Suffragette City) was also issued as an "A" side to promote this compilation. 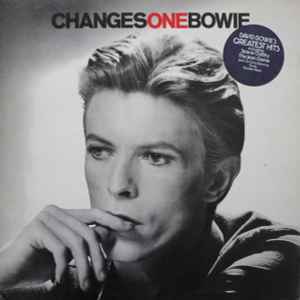 Of the RCA editions, early UK editions contain an alternative 1973 recording of "John, I'm Only Dancing", this soon changed to the recording from the 1972 single. Listening now and the mastering sounds brighter than the original, although it also sounds a bit compressed. "John, I'm only dancing" is a different recording to the original version as well. All other tracks appear to be the same recording/mix as the originals. Question: Does the German version come with a cardboard cover? The photos are from the USA issue, was this also issued like this in Germany? The mastering is lacking a little but it sounds pretty good, some songs better than others but the drums and bass are given good detail on this issue. It's the vocals that sound a little compressed. Vinyl is also pressed flat, center and quiet. I would definitely recommend picking this up, for $20 it will provide a decent sound to spin. My copy doesn't have the MainMan logo on the back but the version of john I'm only dancing is the original one, not the sax version. Lucky enough to have snatched two and getting black AND clear! :) I guess it really is a fifty-fifty unless you do the light trick. DONT PAY FLIPPERS DOUBLE FOR CLEAR VINYL -- Collecting records should be fun, not a rip-off. A great remastering job. Improvement even over Ryko's au20 series.